Two mornings (Tuesday and Wednesday) last week, I took a Driver Safety class at the local senior center. The six hour class will result in a discount on my vehicle insurance for the next two years. I also attended the class in 2014 and 2016, and even though the material is the same, it's good to have a review. I always learn something new. The local Chamber of Commerce provides instructors for the classes that are offered four times throughout the year. The program is scripted and videos supplement the course booklet. On the second day, a representative from WDOT usually comes to speak to the class about up-coming projects and changes in state law. 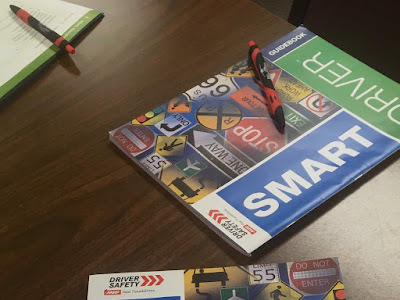 Driver's Education was taught when I was in high school many years ago, but most public schools today do not offer the program because it's difficult to find instructors. The knowledge and experience today's drivers receive before obtaining their licenses is minimal, at best. According to data compiled in 2016 by the National Highway Traffic Safety Administration (NHTSA), 37,461 people were killed in 34,436 crashes, an average of 102 per day. The representative from WYDOT told the group, if an airplane crashed and killed over 100 people a day, the country would be outraged and demand change. Why do we allow this carnage on our highways year after year? Personally, I think EVERY new driver should be required to take a driver's education course before being licensed. If the public schools cannot provide the course, then the insurance companies should take on the responsibility. I also think a refresher course should be required every five to ten years for every driver, regardless of age. What are your thoughts? Stephen had to take a "drug awareness" class before he could get his learner's permit. His high school offered Driver's Ed, but only theory. There was no behind the wheel class like I had as a teenager. I have mixed feelings about requiring refresher courses. Those that follow the rules about those things would take the course, but the worst drivers would probably find a way to "get out" of taking the class just like they find a way to get bogus inspection stickers for their cars. The ones that need it the most probably wouldn't take the class. Good for you! I agree with you on Driver's Ed... and I think people should have to pass a refresher written and road test (not just course) before they can renew their license (every five years here in Ontario). There are soooo many people here who shouldn't be behind the wheel! This is a great idea. Wish our state had something like this class. Kids in our state can still take driver's ed, but they have to pay for the class and it usually is done in the summer. And I agree that every new driver should have to take a class. I also took drivers education in school as did Dennis. Our schools don't offer it anymore but in order to get your license before 18, you have to take a class outside of school. I think it's a very good idea. Before 18 the drivers aren't allowed to have any minors in the car unless it's a sibling. Another good idea in my mind. Good for you Nancy! I was always a great student, but even as a nurse required testing made me so nervous. I always passed and did well, but I wouldnt want a madatory test even for driving. I took driver's ed in HS with an on-road instructor, then 50 hours behind the wheel with my dad before I could go for my test. The State Police gave the tests - one on a driving course set up at their barracks with orange cones for lane delineators! - and the other out on public streets. It was intimidating but good experience. I agree about re-testing. I rode with my dad a lot and could tell his alertness dropped off a bit as he aged. Nice to know you care enough to keep vigilant behind the wheel! I agree about the retesting! We had drivers education in high school too! I would never have learned how to drive without it! I do agree some seniors need to be tested. My mother in law just got her license renewed and she can barely walk! I love the idea - and a discount - I am all over it! Having 3 boys - I made each one of them take drivers training , and then sit with our insurance agent, and then ... well - I was tough ;-) but I'd rather be safe than sorry!